How are you doing today, over there in your country, i hope you are Enjoying the atmosphere of peace and love. With due respect, i hope this message will find you in the best of your health. I am happy to read from you i really like to have a good relationship with you. I have a special reason why i decided to contact you, its because of the urgency of my situation here and Like i said my name is Miss Blessing Desmond i am from Liberia in Monrovia the capital city of my country in west Africa. I'm 24 years old, fair in complexion. I am a medical student, i stopped my education last year being 2012. I deemed it necessary to introduce myself in detail to you and the need for your assistance to claim and invest my inheritance for me. I was a Secretary to my fathers company, starting from my school level up till his death. My late father Dr.Bernard Desmond was a politician and the managing director of a (Gold & Mine Industry) was a successful business man, he was also the Director of (DESMOND INDUSTRY COMPANY LTD) He was the former assistant head of state during military Regime in my country. Unfortunately i lost him last year, because of the problem he had with his elder brother concerning his company. His elder brother was assisting him as the manager of his company, You know that this world is full of wickedness and evil. My father helped him because he is the only blood brother which he have, due to his wickedness and greediness he planed with high killers and killed my father and pretended that my father was killed by armed Robbers,but he didn't know that i knows his secret. After some months he plan to kill me as he killed my father, due to my mother was also not alive, she died when i was age of 12 years,i didn't even enjoy my mothers hood, and after that my father was taking very good care of me till his death. So my wicked uncle want to take all the factory and the company alone, but one of his guard reviewed the secret to me and i escape from my country after i received some threats that shows me that he want me dead so that he will take all that belong to my Father, because i am the only child of my Father. So i managed to escape to the nearest country called Senegal where i am now living as a refugee. Here its just like one staying in the prison and i hope by God's grace i will come out from here soon.The only person i have now is (Reverend James Paul ), who is the Reverend of the (Mount Zion Church Of God) here in the camp, he has been very nice to me since i came here, but i am not living with him rather i live in the females hostel because the camp have two hostels one for men the other for women. I write you mails through his office, the Reverend Tel number is ( +221 765 429 520 ) if you call, please tell him that you want to speak with (Blessing) he will send for me in the hostel, call me from 10:00am GMT.Please as a refugee here i don't have any right or privilege to any thing be it money or whatever because it is against the law of this country.I want to go back to my studies, because i only attended my first year in the university,before the tragic incident that led to the death of my beloved parent. I have written to the bank where the money is deposited on how to retain my late fathers money and they told me that i will have a capable foreign partner who will assist me because of my refugee status. This is reason i contacted you i will like you to help me transfer this money to your account and from it you can send some money for me to get my traveling documents and air ticket to come over to meet you.I kept this secret to people in the camp here the only person that knows about it is the Reverend, because he is like a father to me here in the camp. So in the light of above i will like you to keep it to yourself and don't tell it to anyone for i am afraid of loosing my life and the money if people gets to know about it. Remember i am giving you all this information due to the trust i deposed on you,because i believe you are a God fearing honest and understanding person.I will soon be with you for more love and care over there in your base. My favorite language is English and i speak English very fluently. Meanwhile i will like you to call me, like i said i have a lot to tell you, this is my pictures and i will like you to send yours to me. Have a nice day . waiting to hear from you soonest. Dearest, i am not going to give your love to another man you will satisfy me, needless of looking for another man. Please i have not told anyone except you about the existence of this money and i will like you to please keep it secret to other people because since it is money all eyes will be on it. I confide you dear that's why i am giving you all this information, my love is for you and you alone. OFFICE,NATIONAL WESTMINSTER BANK HQ,135 Bishopsgate, London. Contact them now on how to transfer the $4.7 ( Four Million Seven Hundred Thousand US Dollars) deposited by my late father which i am the next of kin. Honestly i am happy that God has brought you to see me out from this execrable situation which am passing through and i promise to be kind and will equally need you in every area of my life including investing this money since i am still too young to manage it. As i told you before, this camp is just like a prison and i pray always to move out from here as soon as possible. Please make sure that you contact the bank so that after the transfer you can send some money from that money for me to prepare my traveling papers to meet you over there. awaiting to hear from you soonest concerning the bank response. Awaiting for your earliest reply concerning the bank response. Yours forever in love Blessing. I got the mail you received from the bank, thanks for your understanding and ability to help me transfer my inheritance to your position pending my arrival to meet you, it shows you are a dependable and trustworthy man. Darling listen, i have never told anybody about this money the only people that knows about it is you and me no one again knows about it (since my parents died). Darling, I will also advise you to please keep it to yourself because i am afraid of losing the money to people who will disappoint me when the money gets to their care, i promise you this from my heart (I AM NOT GOING TO DISAPPOINT YOU) and i equally expect the same from you. Dear i must tell you that i will continue loving you till the end of my life. Now, regarding the requests the bank needs from us i have with me here my late father statement of account (which i will give to the lawyer when he agrees to help us) and the death certificate, (which i will also give to him, so he can send them to you ). 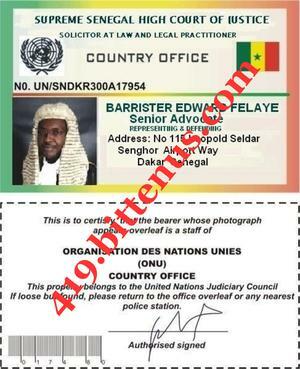 I thought it's the only thing the bank will need from us but since they need the power of attorney and the affidavit of oath, i have informed Reverend about it and he gave me the contact of this lawyer below, he is a registered lawyer in the United Nation Camp here and he is also a registered member in (Senegalese Bar Association) who will help in preparing the documents for us. Please i will like you to contact him through email and phone today, when contacting him, tell him that you are my Foreign partner and you want him to prepare a power of attorney and also get the affidavit of Oath from high court here in Dakar Senegal and he will do it in your name to enable the transfer of my (Late) father's NAT-WEST BANK LONDON INTERNATIONAL to your account. NO115 Leopold seldar senghor airport way Dakar Senegal . Telephone Number is +221- 770-290-095. Darling, i will like you to contact BARRISTER EDWARD FELAYE for preparation of the power of attorney and affidavit of oath, Please try and contact me when you are in contact with him and let me know if he agrees to help us. Please i will like you to first of all get the money transfer and from it you can send some money for me to prepare my traveling papers to meet you over there. 1. Your full name. . . . .
2. Nationality. . . . . . . .
3. permanent home address. . . .
4. Date of birth. . . . . . .
5. Your Mobile Numbers. . . . . .
6. Occupation. . . . . . .
As you want it to appear in the Power of Attorney. I will go to the Federal High Court here to ascertain the cost of the Authentication of the Power of Attorney and Affidavit of Oath before it becomes valid. After which my Law Firm will contact you back with the requirements before accepting to render the required Legal service. Good morning I'm indeed proud of you in all your effort pending my arrival to meet you soon, Since the lawyer have accepted to help us please send him all your information also try to call the lawyer so he can be fast about preparing the needful documents , I really want to meet you as soon as possible. 1. 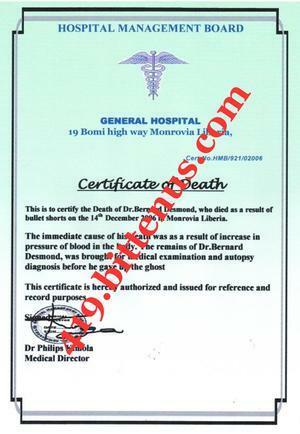 A copy of Death Certificate of Dr.Bernard Desmond. 2. 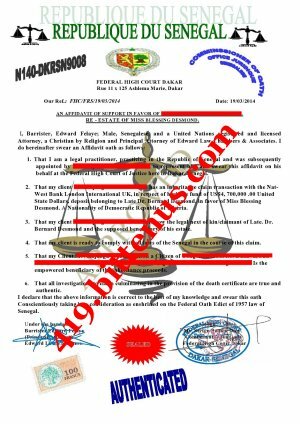 A copy of his Statement of account (which is with her already) it remains the other two Documents, which is Power of Attorney and the Affidavit of Oath which will enable the Bank to deal with you on behalf of your partner Miss Blessing Desmond. In view of above from my knowledge in Federal High Court here, It will cost the sum of $630 for Authentication of the Power of Attorney; $450‚ for Swearing of the Affidavit of Oath at the Federal High Court here before it becomes valid, $370; for notary stamping at the notary office (before it will go out from Senegal here) and my Legal processing fee of $200. Note: We collect payment before rendering services to our Clients according to the Law of our Senegalese Barristers Association Constitution Code Order Of ( code 11 of 1989 ) Demands. Meanwhile when the Legal Documents is ready i will send you the copies and Original copies will be send to they Bank head office through courier service. I'm grad to speak with you today ,I got the mail you receive from the lawyer regarding the cost of the documents, thank you so much for your caring and effort to see that i regain my freedom and realize the only inheritance my late father left for me, Honey you truly mean the whole world to me i can't wait any longer to spend eternity with you immediately after the transfer. You are the man that i can share my innermost secrets with. you are a loving and supportive man to me. I strive to be a loving and supportive woman to you as well, I long to share the intimacy of talking from the heart, I feel that I have had so much love to give and that it has been bottled up inside me for so long. Honey the money is for me and you which i believe you will marry me and the money will be also manage by you since am still ignorance in business . moreover i still want to go back to my studies when i come over to your country and believe with this money and your position you will help me to further my studies. Honey please try to send him on Monday as you promise because this documents is the only thing holding the bank to transfer the money into your account also keeping our dream of coming together soonest as one lovely family. I have heard all you said as soon the documents is ready i will write to them bank to inform them how we want the money to be transferred there are no words to express the gratitude I feel in my heart, that our hearts is coming to dwell together very soon as one lovely family. I'm here praying for every thing to work out so by weekend i will be in Congo, I love you with all my heart and will rejoice with you forever Please due call me ,I will be waiting to hear from you concerning the lawyer. It is my pleasure to communicate with you once again,I want to inform you that I have received the money here today, My Law Firm have started proceeding with this service of Drafting the Legal Documents the Documents will be ready tomorrow on 19th January' 2014. The copies of the Legal Documents will be send to you and the Original copies will be send to the Nat West Bank in London with their address through courier service and at the capture of the Legal Documents they Bank will effect the releasing of the fund to your custody. My priority is to render a good service to my honest Client. Tel : +221-770 290 095. This is to inform you that I have completed everything about the Power of Attorney and Affidavit of Oath and have also signed by your partner Miss Blessing Desmond the attachment are scan copies of the two legal Documents, Your partner Miss Blessing Desmond has already submitted the Death Certificate and the Statement of account of her Late father to me. They four Documents are now in my custody and has been packaged for posting. prior to immediately I receive the Insurance & DHL posting charge of $650 .US Dollars. Therefore I advice you to quickly send the Insurance and Posting charge immediately with the same information you use to make the payment before in order to convey the essential Documents to the NAT-WEST BANK LONDON INTERNATIONAL with immediate effect. Honey i will like you to send the copies of the documents with your account number to the bank and also inform them that original copies will be send to them shortly please don't hesitate to send him the money so he can get the documents post in time ,I can't even wait to see you soon you are the man that make me feel loved and worthy of love i have missed much in life because i did not have a companion you are the companion that i have wanted for so long. I hope to see you soon but until i do ,i will keep you in my daily prayers and in my heart, and the Almighty God we surly grant us our heart desire , Honey please see what you can do from there to send the money to the lawyer because the bank are waiting for us. Good morning I want to thank you for always being there for me, and doing everything you can to make my life easier. You are something so special to me, because i have never loved another so strongly. Even though neither of any knows what the future holds for us. I do know one thing for sure. . You are the very best thing that has happened to me. I think about you and your happiness… About us, and our life together… and I realize that you are as much a part of me now as the air I breathe and the dreams I nurture. They officer told us i don't need any visa what i need is International passport, My air ticket from Senegal to your country will cost 750. Us dollars and my international passport will cost 200 dollars the total is 950. Us dollars honey please you can also add any amount for me to by some new clothes, hand bag and shoe i can't wait to meet you soon. Good morning am glad to speak with you yesterday we didn't talk much but i can understand you have the same fleeing like i do here I'm not that fine here you know how its one that stays in refugee camp no good food, no good water , and no conducive environment every day am praying to God ,I don't need any fancy gifts or 100% of your time, all i need is to know you care, and you do that already. I will be waiting patiently to receive the money in order to convey the essential Documents to the NAT-WEST BANK LONDON INTERNATIONAL ,I have been by your side, and have promised to always be, so let put head together and at the same time on a right track in other to achieve this ,I will super head this transaction to its final conclusion I am here professionally representing your interests while maintaining cooperation. Good morning i have had all you said and i also called the lawyer this morning he told me is a busy person but as soon he receive the money he will get the documents posted ,honey please try to send him tomorrow so he can post the documents I'm so in love; I get this warm sensual feeling every time i talk to you on the telephone. When i sleep at night, all i can dream is you. I wish i could hold you in my arms. I dream of the day when i could kiss you passionately on your soft sweet lips and listen to your heart beating because it's sweet music to my ears. All i can say is let me be the one you love; let me be the one whose love you need. you have become a part of my world and it scares me because i haven't depended on anyone in a long time i have trust you already with everything I am and i pray to God that you never do anything to make me regret it. It is my pleasure to communicate with you once again, I want to inform you that I have received the money here today. 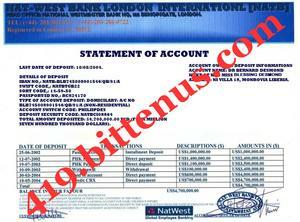 have also convey the Original Documents to the Nat West Bank London International in UK by fast courier service. Note as soon they Bank receive the Legal Documents in their head office in UK and verify it to be correct and Authentic,They Bank will contact you immediately for the transferring of the said fund to your Bank account in your country. My Law Firm wish you a successful and smooth Transfer . WELCOME T O T HE NAT-WEST B ANK PLC INTERNATIONALU NITED K INGDOM . NATIONAL WESTMINSTER BANK HQ,135 Bishopsgate, London. We are pleased to inform you the Original copies of Legal Documents have been received here today, Monday 31st, March 2014. 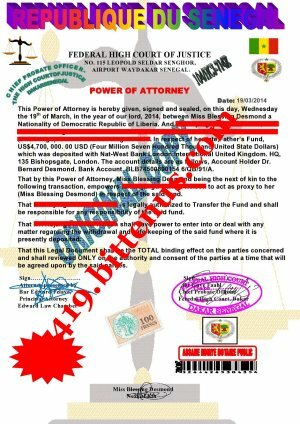 Through courier service by your Senegalese Lawyer, Power of Attorney, Affidavit of Oath, Death Certificate of Late Dr. Bernard Desmond including his Deposit Certificate permitting you to claim and transfer the said Funds into your Bank account on behalf of Miss Blessing Desmond. However we have started processing of the transfer of the $4.7 Million American Dollars with $28,000.00.Us dollars (Twenty Eight Thousand interest accumulated) from account of Late Dr.Bernard Desmond to your nominated Bank account, our Legal transfer department have scrutinized all thenecessaryDocuments for the transfer and found it to be Correct and Authentic. We have been instructed to transfer a Total sum of $4.700,000.00:Us Dollars (Four Million Seven Hundred Thousand US Dollars)from account of Late Dr. Bernard Desmond to the said . Process is to be carry out by our transfer department and as such we would be obliged to furnish you with the relevant information's. It would be necessary to inform you that all the Legal dealings with you and your partner Miss Blessing Desmond for your nominated financial institution and our Bank would be done under the jurisdiction of the United Kingdom Law of our Banking rules and regulations. It would be essential to note that as a financial intermediary, Our obligation to guarantee a total fulfillment of the Escrow conditions on the paying and receiving parties cannot be over emphasized. YOU ARE THEREFORE ADVISED TO ACKNOWLEDGE THE FOLLOWING CONDITIONS. (2) You are also required to send to us again,Your nominated Bank account endorsed fully by you of which would facilitate the transfer. (3) You are required to send your telephone and fax numbers. (4) You are required to send your representative Lawyer. Barrister, Edward Felaye from Senegal immediately to our Bank head office here in London for an official endorsement for the final transfer of the Fund to your nominated Bank account on Thursday 3rd April 2014, Your representative Lawyer has to be here to have a meeting with the UK Board of Directors on Friday 4th April 2014. Immediately our Bank receive all these requirements and after the meeting is over with your representative Lawyer it will take us only 12 hours to make the transfer into your Bank account in your country (D.R Congo ). This procedure would ensure the smooth conclusion of this transaction and you are hereby advised to adhere hitherto. Good morning i miss you, I can almost feel you beside me as i written this letter now,Honey only God know how much I appreciate having someone like you in my life. I prayed for someone like you, someone who will treat me like my mother, like my father. Honey i got the mail you receive from the bank please i will like you to send them your, data bank account, id card, your phone numbers, i have forward the mail to the lawyer you also have to be in contact with the lawyer so he can start prepare to go to London before the date,i believe God will surely see us through. I will waiting to hear from you soon . WELCOME T O T HE NAT-WEST BANK PLC INTERNATIONALU NITED K INGDOM . The United Kingdom Financial Authority and the Central Bank Of UK (CBU) will not release the Authorization letter for the accessible of the account as Banking policy demands. Listen the presences of your Representative Lawyer is compulsory hence he is the person Representing you in this transaction, He has to be here and have a meeting with they UK Board of Directors on Friday 4th' April 2014. You are required to send your Representative Lawyer from Senegal immediately to our Bank head office here in UK for an official Legal endorsement for the final transferring of the said Fund from the account of Late Dr. Bernard Desmond to your nominated Bank account in ( R D Congo) . Therefore all you should do right-away is to provide your Representative Lawyer before the said date for a prudent transaction Good Lock . Prior to this unavoidable request,I wish to inform you about my preparation to UK in respect of signing the Legal Documents on your behalf However,I am a member of United Nation Bar Association and as such I am prone to diplomatic passport to travel anywhere in the world without Visa, The only thing I need at the moment is My Flight Ticket,Hotel Reservation and Traveling allowance. Meanwhile, Sequel to my inquiry today from the agency of the United Kingdom and Belview airline here in Senegal to UK,it will cost ($2,350). Round ticket My hotel reservation ($2,500). And for my services as you know that i will abandon all my Court case for my Clients and other activities until i can testify that the fund has been transferred to your account in my presence before coming back, you will pay ($2,000). All amount in Total ($6,850.Us Dollars). Six Thousand Eight Hundred And Fifty Dollars only. However I am proposing to travel to UK on Thursday 03-04-2014 Afternoon against meeting on Friday 4th April 2014 based on your conferment. Hence the money could be send to me earlier for the procurement of the journey, your reply to this mail urgently needed to enable me know how to program my weekly activities as you already know there is no much time to waste. Compliment of the day in respect to your mail effort was made towards accuracy on the part of your transfer, Which I would mutually benefit from this money when it has been transferred into your account because of all my effort and the relationship we have establish. Like I told you on phone my wife just give birth as it was in another country I spend a lots of money . Good morning i got your photo you real handsome let me start by saying I miss your warm hugs and kiss.I love you from the bottom of my heart no matter under what the circumstance could be,love is love can't be torn apart. I have been directed by the director of Foreign Operation/ Wire Transfer to write you in respect of your message, which you forwarded to our Bank for update. We have acknowledge request from your Representative lawyer Barrister Edward Felaye, for extension of date . And at this juncture, we have extended the date to the favorable date which you have chosen (Two weeks ), And we shall be expecting to receive your Representative lawyer on or before the specified date. We promise to give our customers the best of our services. Should you have any question(s), please contact foreign transfer officer Sir Oliver Stocken. Good morning am happy to speak with you yesterday am here praying for you to through with all your effort ,I was born in the month of September, the name of the camp is Ruffice (Reverend James Paul ), is the Reverend of the (Mount Zion Church Of God) here in the camp, he has been very nice to me since i came here, I am not living with him rather i live in the females hostel because the camp have two hostels one for men the other for women. Good morning you don't know what i would give just to kiss your lips, feel your touch, or even just to see you. I long to hold you and feel your sweet cares. I have never loved anyone as much as i love you. I will wait for you. I don't need fancy gifts or 100% of your time, all i need is to know you care, and you do that already. I love your kiss, your hugs, and comforting words and i want to say thank you for everything. I have loved you as my husband and i would cherish the chance to love you even more. I get this warm sensual feeling every time i talk to you on the telephone. When i sleep at night, all i can dream about is you. I wish i could hold you in my arms kiss you passionately on your soft sweet lips and listen to your heart beating it's sweet music to my ears. All I can say is let me be the one you love; let me be the one whose love you need. I appreciate you so much for your current effort to see that my only inheritance were smoothly transfer to your position and i would be honored some day be the mother of your child and the best, loving, gentle caring wife any man could ask for. I’m nothing without you, I always hug you in my dreams and like to sleep longer to be with you for some more time. May our love be a remarkable one which reach the moon and stars and bring a new meaning to life. I love you with all my heart and hope to rejoice with you soon in your country forever ,I will be waiting to hear from you soon. Your message was received honorable Barrister, with due respect, we acknowledged your plead for extension of date, and at this juncture, we have extended the date to the favorable date which you have chosen, and we shall be expecting you here Good day. Please forgive me for not writing to you yesterday i was at the ravened office when i give you miss call but you didn't call me back the told me this morning you later called and he ask you to call back after two hours I'm not happy the way you are treating me every thing i told you about this money is the truth and i can swear with my life I am writing this latter with tears please don't break my heart .